Google Games to be powered by Zynga ? Google has invested anywhere between 100 to 200 million dollars in the social gaming giant Zynga. 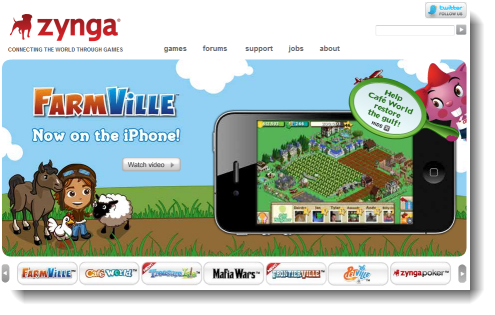 Zynga if you dont know is the company behind the super hit Facebook games such as Farmville and Mafia Wars. The investment was made by Google itself and not Google venture, the venture capital division of Google. The news comes in as the reports of a possible attempt by Google to take on Facebook with Google Me. Kevin Rose, Digg.com founder, had tweeted that Google has a ‘Facebook killer’ called Google Me in the works. The deal could thus could also be a huge boost for the Google Games platform which is set to be unveiled later this year. Google has been facing some setback with their current social networking platform Orkut loosing to Facebook in India, the only country other than Brazil where Orkut dominates Facebook. Zynga is PayPal’s largest single customer, it would not be surprising to see PayPal being replaced by Google Checkout! The reason these deals are so attractive to companies like Yahoo and now Google is this – Zynga allows them to rebuild the massive social graph, currently controlled by Facebook, TechCrunch is reporting.